Zoe Meleti invites you to join her relaxing and spiritual program in Greece! 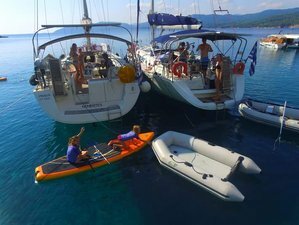 Sailing in beautiful Greece and practice yoga in the islands is an alternative way of vacation. In this retreat, you will have the chance to learn more about yoga. It is perfect for you who are searching for a retreat that includes a variety of yoga. You will also be able to do meditation and learn more about chakra. All of this activities will surely help you to rejuvenate your body and mind. You will stay in a yacht that could accommodate up to six persons. There are two types of yachts that will be used in this retreat depends on the package that you choose. There is Beneteau Oceanis 38.1 and Beneteau Oceanis 46. The layout offers up to eight berths with three double sleeping cabins separate from the main accommodation. There is full standing headroom and excellent ventilation throughout. In the fore cabin, there is a good sized double berth. It has an opening hatch to the deck and two portlights. En-suite heads compartment with marine toilet, shower, and washbasin. In the saloon, there is a dinette to starboard with galley opposite. It also has Nelson two burner gimballed gas cooker with grill and oven and a large refrigerator. Oceanis 38.1 has twin stainless steel sinks with hot and cold pressurized water system. It also has 450-liter freshwater capacity in twin tanks and chart table to starboard. There are two opening deck hatches and three opening portlights. There is separate heads compartment with marine toilet, shower, and washbasin. Twin aft cabins, both with double berths and hanging lockers. It also has a radio / CD player and television. Oceanis 46 is a yacht built in 2011 which has two bathrooms, four cabins, and it is could accommodate up to 10 people. You will have a different discussion in which you quote your opinion regarding yoga. After that, you will have a great practice with asanas (yoga poses) and ujjayi pranayama (diaphragmatic breathing). You will learn how important breathing is. At the end of the practice, you will enjoy savasana (relaxing pose) for 15 - 20 minutes. Today, you will have a Hatha yoga practice and also yoga asanas in which you open your chakras and energize the body. You will also learn to concentrate. Ujjayi pranayama could help you to concentrate your mind and have a better estimation of your body and mind. At the end of the class, you will relax in savasana. You will have an open discussion where you will understand the secret of a better ‘mind’. In this practice, you will analyze the terms above. You will learn to curb your mind through the self and ethical disciplines. All activities in life are connected with your inner feelings. Is this real? Afterward, you will enjoy savasana for 15 - 20 minutes. On this day, you will learn that the body is a fit vehicle for the spirit and learn the advantages of Power yoga. You will invigorate your body with advanced asanas and reduce your fatigue though different postures of yoga. You will also release toxins with kapalabhati breathing. After a difficult practice, savasana becomes more necessary. You will start to practice Surya Bhedana pranayama which is an invigorating breathing. You will do stretching and energetic postures which will help you to keep your body flexible and strong. After that, you will have Sun Salutations, Vinyasa flow yoga, and relaxation at the end. After that, you conclude the day with meditation. Meditation is important to achieve a clear mind. The sounds from the sea and nature will make you feel rejuvenated. Today, you will have a dynamic practice where you will focus on heart opening. You will learn the benefits from chest opening and relief from backaches. In this savasana yoga, the teacher will sing a relaxing melody. In this final practice of the week, you will have a challenge in Astanga yoga. Interesting postures could be accomplished with a magic way through a different lesson. Savasana would rejuvenate your body and your mind would be more restful. This retreat will be held in Sporades, Greece. This vacation is available from April to September with arrival on Saturday.